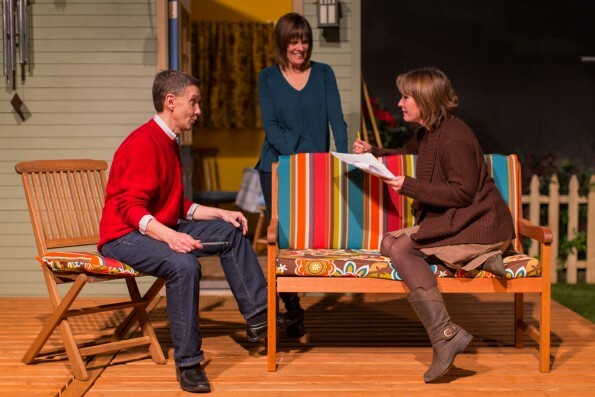 Two Stories by Utah playwright Elaine Jarvik is a work as contemporary as today’s headlines. Salt Lake Acting Company’s world premiere production opened February 4 and runs through March 1, 2015, and reflects America’s changing ethnic, economic, and generational demographics. It also raises questions about cultural misunderstandings and the role of the media in bringing individual stories to a larger audience. What happens when good people come into conflict over their differences? For instance, when a “public” interest in neighborhood preservation conflicts with an individual’s “private” American Dream manifested as a two-storied “monster house”? Who “owns” the space, the light, and the views the house will affect? In the play, journalist Jodie Wolcott is barely hanging on to what she has–her house and her job with a traditional paper-and-ink newspaper. She needs a story to keep both. Then the Masoris–an upwardly mobile Pakistani family–move in next door, and Jodie develops a friendship with Bashira, grandmother of the clan, from whom she learns the details of the family’s abrupt exodus. It’s a story that could save Jodie, but printing it angers Amir, Bashira’s son. Tensions explode over the family’s plans to add a second story to their home, changing the look of the neighborhood in the process. Enter Jodie’s coworker, Hispanic reporter Melinda–who’s assigned to sort out what has happened. Now it’s Jodie’s turn to experience the loss of control that occurs in having her story reported by and in the media. All told, the play is a rich mix of themes, characters and issues with no easy answers, and Salt Lake Acting Company does it all under the resourceful direction of Keven Myhre with just five cast members: Alexandra Harbold as Jodi; Tamara Howell as Bashira; Tito Livas as Amir; Elena Dern as Melinda; and Zack Phifer as Jodi’s husband, Kevin. Two Stories runs approximately 90 minutes, with no intermission. Performances are Wednesday through Saturday at 7:30 p.m. and Sundays at 1 and 6 p.m. There will also be two Tuesday performances, February 17th and February 24th, at 7:30 p.m. and two Saturday Matinees at 2:00 p.m. on February 21st and 28th.